Nothing is more comforting than a bowl of good gumbo with a scoop of rice on top. 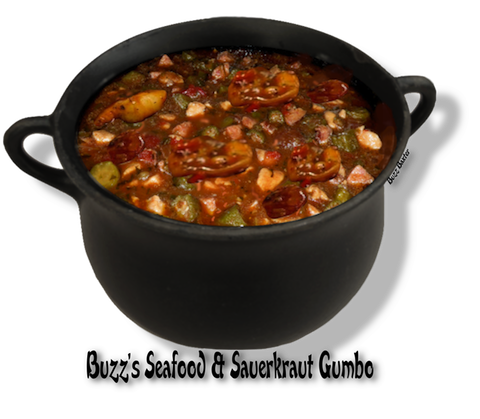 This gumbo has all the bells and whistles including okra and yes...sauerkraut! This is really bread sopping good. I like San Francisco sourdough, Pugelise, or Como bread. •   4 cups cooked long grain rice. and constantly, make a dark brown roux, the color of chocolate, 20 to 25 minutes. with Creole seasoning. Cook,  stirring, until the vegetables are very soft, 8 to 10 minutes. remaining sliced sausage to the gumbo. Cook for an additional 15 minutes. surface. Taste for seasonings and adjust. 7. Pass the file powder at the table. 8. Garnish with a sprig of Italian flat leaf parsley. check before you add more.